Waste-to-energy is the use of modern combustion and biological technologies to recover energy from urban wastes. The conversion of waste material to energy can proceed along three major pathways – thermochemical, biochemical and physicochemical. Thermochemical conversion, characterized by higher temperature and conversion rates, is best suited for lower moisture feedstock and is generally less selective for products. On the other hand, biochemical technologies are more suitable for wet wastes which are rich in organic matter. The three principal methods of thermochemical conversion are combustion (in excess air), gasification (in reduced air), and pyrolysis (in absence of air). The most common technique for producing both heat and electrical energy from wastes is direct combustion. Combined heat and power (CHP) or cogeneration systems, ranging from small-scale technology to large grid-connected facilities, provide significantly higher efficiencies than systems that only generate electricity. 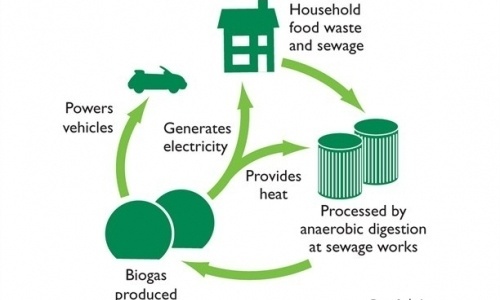 Biochemical processes, like anaerobic digestion, can also produce clean energy in the form of biogas which can be converted to power and heat using a gas engine. Anaerobic digestion is the natural biological process which stabilizes organic waste in the absence of air and transforms it into biofertilizer and biogas. Anaerobic digestion is a reliable technology for the treatment of wet, organic waste. Organic waste from various sources is biochemically degraded in highly controlled, oxygen-free conditions circumstances resulting in the production of biogas which can be used to produce both electricity and heat. The physico-chemical technology involves various processes to improve physical and chemical properties of solid waste. The combustible fraction of the waste is converted into high-energy fuel pellets which may be used in steam generation. The waste is first dried to bring down the high moisture levels. Sand, grit, and other incombustible matter are then mechanically separated before the waste is compacted and converted into pellets or RDF. Fuel pellets have several distinct advantages over coal and wood because it is cleaner, free from incombustibles, has lower ash and moisture contents, is of uniform size, cost-effective, and eco-friendly. Tagged Anaerobic digestion, Biochemical, Biogas, CHP, combustion, Electricity, Energy, Fermentation, Heat, Middle East, MSW, organic wastes, Physico chemical, RDF, Solid Waste Management, Syngas, Thermochemical, Urban Wastes, waste, Waste to Energy Pathways. Bookmark the permalink. Very Informational! Thanks for sharing. I am keen to learn more on this topic. What in your opinion if the best pathway and why? Can you point me to an article where I can see a comparative analysis of these? Thanks for your query Jim. It is a bit difficult to proclaim any WTE technology best or otherwise. There are a variety of factors to be considered in the selection of waste-to-energy technology for a particular project – size and location, budgetary constraints, waste quality, PPA/offtake agreements, supply chain, end-products etc. A technology which may be effective for Austria may not be conducive for India or Latin America. These articles may be of some help in formulating an informed opinion about different technolgies. That helps! Thanks for your quick reply. Glad to know that the information was useful. Very good descriptions of energy conversions. Biochemical conversions contribute to forms or energy that we use on a daily basis. Thanks for your kind words. Glad to know that our website has been useful in your academic pursuits. Thank you so much. this information has helped me a great deal in my environment and energy class. I am so very grateful to you. just a question that was in my mind. which of these pathways is best suitable for a place like dhaka? and why do you think so? Thanks for your kind and encouraging words. Happy to know that you liked the article. MSW in developing countries, like Bangladesh, is unsorted and mixed which makes it difficult and expensive for biological degradation, i.e. anaerobic digestion. Thermal technologies like incineration and gasification are better technological options. Thank you for such a speedy reply. In my assignment I was asked to suggest a suitable and feasible conversion method and i suggested gasification as incineration has a high GHG emission. I just wanted to see if my analysis was accurate and whether it was the same as yours. Thank you. you have helped me much and taught me much. The conversion efficiency and eco-friendliness of gasification is definitely much better than that of incineration. Please feel free to write anytime.